What are you doing in your European Voluntary Service (EVS) project? - guiding them in their legal applications (asylum seekers aim to get the refugee status in UK, giving them the same rights as any other British citizen, for example the right to work and to have an accommodation), through assisting them in their relationship with amongst others, the Home office and their solicitor. - helping them to familiarize themselves with their new environment, to find an emergency accommodation if necessary, but also food places, friendships, education, leisure, volunteering opportunities, etc. I am meeting the asylum seekers twice a week in two centres, into which they come to receive the British Red Cross’ support. The rest of the time, I am doing follow up work in the office. During my free time, I have amongst other things visited the surroundings of Bradford and made the most of the nightlife of both Bradford and Leeds. What have you learn yet personally and professionally through your European Voluntary Service (EVS) project? - to share a flat with two girls, and forget my single’s habits…! 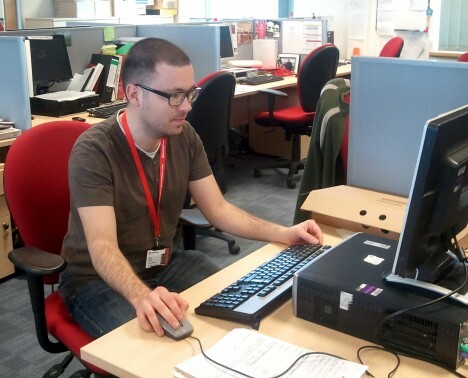 Pierre Beretti, EVS (European Voluntary Service) volunteers at the Red Cross in the UK.